The theme for our ‪‎travel pics this week (and a bit) is I, for Italy. To be honest, the only time we have spent in Italy is in Rome, and in Venice – plus travelling to-and-from – but even those two cities were amazing. 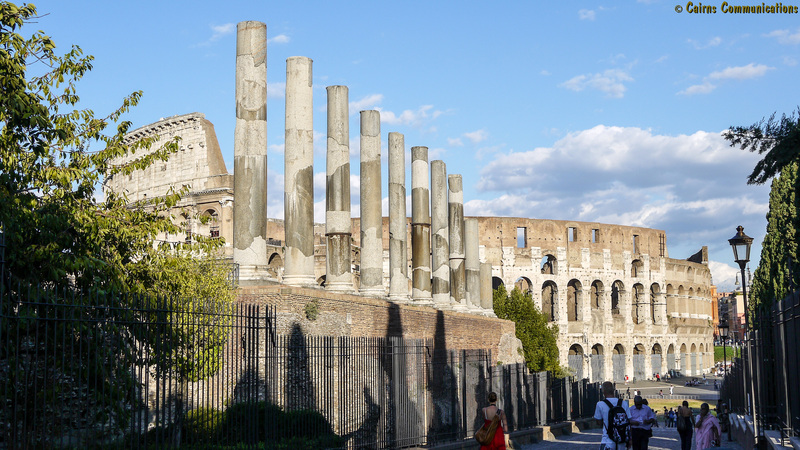 We’ll start with Rome and this magic view of the Colosseum in the distance – but in the foreground, the massive Egyptian Granite columns that were part of the temple of Venus and Roma. Of the literally hundreds of pictures we have taken in Rome, in two separate visits, this remains probably my favourite image of the Eternal City. Travel Pics Theme: J for Jets. Alitalia Alps ahoy! Travel Pics Theme: R for Rome. Al Fresco? No, all’aperto!